Did you ever wonder why bears growl at almost every animal they meet in the woods? It wasn't always like that. Bears used to be friendly to everyone. They would wag their long tails, just like a dog does, whenever another animal came near. One cold winter day, a fisherman had left a number of fish hanging in the water on a string to keep them fresh. Tricky Fox saw those fish and stole them when the fisherman wasn't looking. Fox was on his way back to his den when she saw Bear sitting by the trail. Mr. Bear saw Fox and wagged his tail in a friendly way. He sure liked the way those fish looked and smelled. "Where did you get the fish?" Bear asked Fox. "I caught them," fibbed the Fox. He was embarrassed that Bear had caught him stealing. "How did you catch them?" asked Bear. "The lake is frozen solid!" Fox told another fib, "I have a special way." "Those fish look and smell good," said Bear. "Will you share them with me?" "No," said Fox. "You will have to catch your own." "I sure would like to have some fish like that," said Bear. "Would you teach me your special way for catching fish through the ice?" he asked nicely. Then he wagged his tail again. Fox didn't want to go to the lake with Bear for fear of being caught by the fisherman whose fish fox had taken. And he was tired of the way that Bear kept wagging his tail at him, so, he made up a fib to tell Bear. "Fishing is quite easy," Fox told Bear. "You simply have to cut a hole in the ice and sit down so your tail hangs in the water. But, you have to keep your tail in the water for a very long time." "Don't worry if your tail starts to hurt a little. That just means that the fish are biting. The longer you keep your tail in the water, the more fish you will catch. When you find that you can't move your tail at all that means that the fish are ready to pull up. Stand up quickly and pull your tail out as fast as you can." Oh, my, that tricky Fox could lie! "Thank you," said bear, in a friendly way and wagged his long tail all the way to the frozen lake. He borrowed a drill and a saw from the fisherman's shack and drilled and cut a hole in the ice. Unlike fox who took the fish without permission, Bear asked nicely first and returned the tools when his hole was ready. Bear smiled and took his long tail in his paws and wiggled down to put his tail into the cold water. It was not comfortable, but he was willing to be uncomfortable to catch a lot of fish to eat. 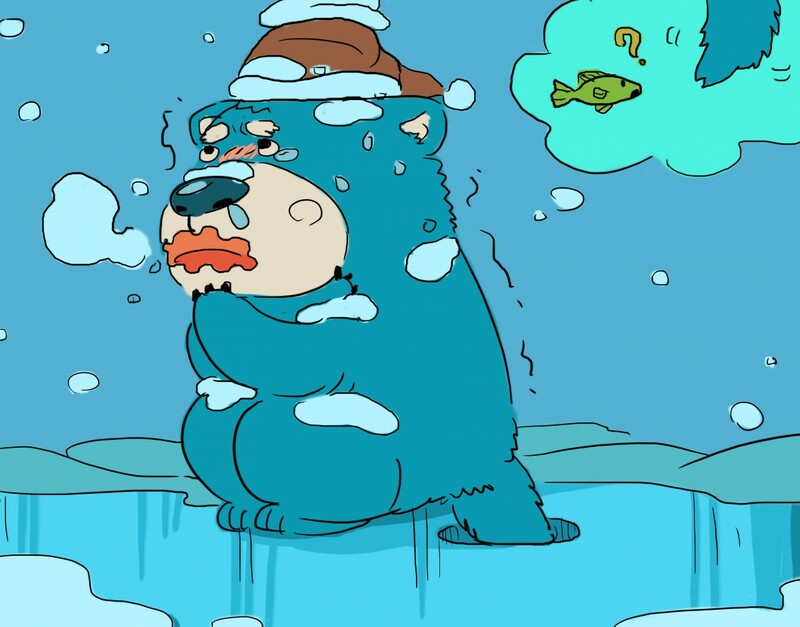 Bear sat with his tail in the water so long that the water began to freeze around his tail. It began to hurt. But, Bear remembered that Fox said if it hurt it meant more fish were biting. He sat for so long that the ice froze solidly around his tail. When Bear realized that he could not move his tail, he decided it was time to quickly pull his tail out of the water. He stood up and pulled very quickly. Bear is very strong, so when he stood up fast, his tail was pulled right off and was still stuck in the ice. Bear didn't get any fish, and he his long, beautiful tail. Bear left with a little stump of a tail. He was upset that Fox had tricked him in such a mean way. Ever since that day, Bears have had stumpy tails. That's also why Bears growl at every animal they meet in the woods and rarely act friendly towards anyone.